Sharon Carter first appeared in comics in 1966 as a relative to Peggy Carter and an on-again off-again love interest to Steve Rogers. Since then she has been seen in television, video games, and film. In the Marvel Cinematic Universe films Winter Soldier and Civil War, she is a member of S.H.I.E.L.D. until its dissolution and eventually becomes a member of the CIA. A skilled secret agent, Carter is often covertly aiding Steve Rogers. Here at Superheroes Direct, fans of Agent 13 will find all manner of collectibles and apparel featuring this superspy, including POP figures displaying her look from the 2016 MCU film Civil War. Keep checking back here at Superheroes Direct for more updates to our ever-growing selection of superhero gear. Agent 13, aka Sharon Carter, comes to the aid of Captain America in the Marvel Cinematic Universe film Civil War. 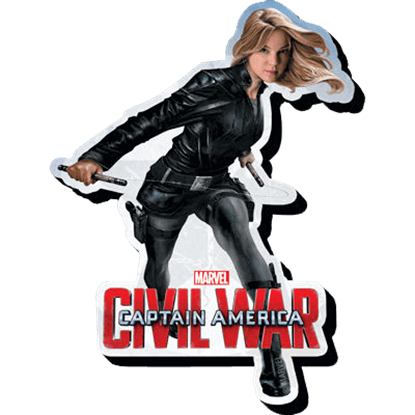 Dressed in black and ready to a fight, she appears in fun magnetic form on the Marvel Civil War Agent 13 Magnet.